"This is a delicious salmon dish for a holiday dinner." Slice, peel, and pith oranges; slice crosswise into 1/4 inch rounds. Season fillets with salt. Place salmon fillets on broiling pan. Place the pan of fillets 4 to 6 inches from heat. Cook for 15 minutes under the preheated broiler, or 10 minutes per inch of thickness. Remove from broiler just before they are cooked through. Sprinkle with vinegar. Arrange orange rounds on top. Sprinkle with green onions and cracked black pepper. Broil 1 minute longer. 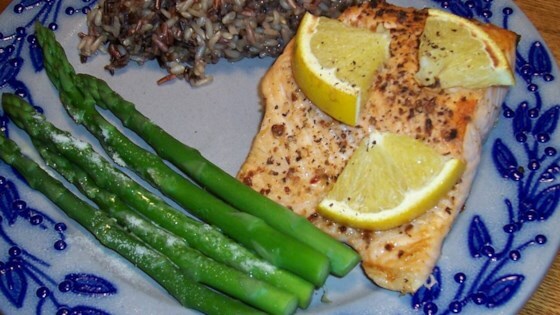 Just a couple basic ingredients can make broiled salmon amazing. Very tasty and easy to prepare. We will make this again! Excellent! This was super easy and tastes delicious.